I'm not a real "water feature" person. I do like water in the garden but it doesn't have to be a feature, however . . . . two years ago Husband Jim and I found the cat. The first year, he sat in a black tub in the place where the "pond" now sits. We loved the charming one-eared cat having fallen in love with this fountain when we first saw it at a Garden Center in the city. Last year, we had a pond dug so he would have a proper place. 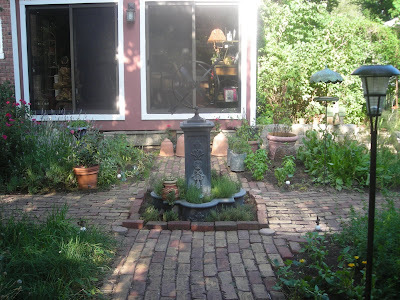 And last year we put in a water lily -- a $30 water lily! As well as three small water hyacinths. The three hyacinths became a mass of hyacinths, that we moved, gave away, threw away . . . all the while the water lily disappeared. . . . . But the hyacinths are not winter hardy on the prairie and so they were gone with the first frost. The water lily grew dormant and, alas, it, too, disappeared. Only to reappear this spring -- and grow and grow and grow. Last week, it bloomed! The first bloom. A rare bloom! It closed at sundown only to open again the next two days. I love water lilies with their big leaves floating on the surface and that bloom -- so extra special. 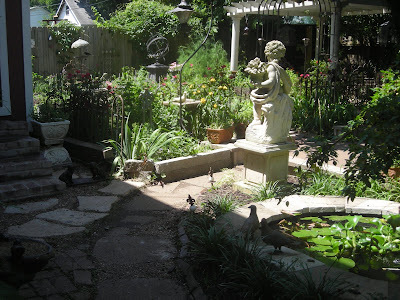 No more water hyacinths for us -- we learned our lesson last year -- our first with the pond. The only thing I could wish for -- a frog to sit on the lilypad. Alas, I thought I had some tadpoles but they disappeared. One of Oliver's duties is to make sure that cats don't bother the fish in the pond -- he takes his job seriously -- always on watch! The pond is his first stop on his morning ritual -- smelling his way around it . . . . and in the year plus that we've had it -- he's only fallen in twice!!!!! Scaring the fish, I'm sure, as much as it scared him! 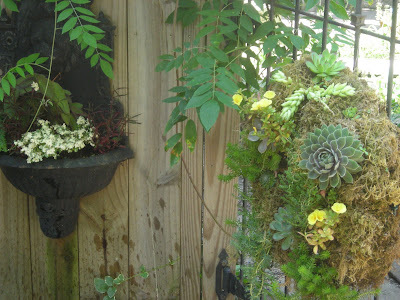 It's Wednesday which means that it's Outdoor Wednesday so please join Susan at A Southern Daydreamer to see what wonderful outdoorsy things there are this Wednesday. The second step was accomplished last week when Husband Jim decided to paint . . . he did not like the white chippy (although I did) and after much discussion, suggested a matte rust color to go with the legs of the piece and the furniture. 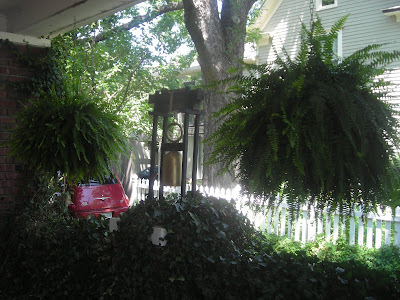 I chose the paint -- which was rust but it now seems almost red to me in the garden -- but it does pick up the terra cotta of garden pots and gives a spot of color to the pergola. I often find that Husband Jim has an uncanny knack for choosing colors -- I'm the "vanilla ice cream" of the pair -- he's the "tin roof sundae"! And surprisingly enough the legs were not painted -- they are rust -- you can't tell in this picture can you? 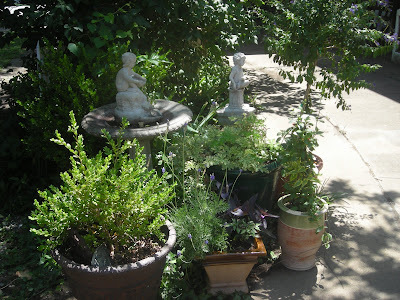 I am looking for a bit milder temperatures when I can enjoy my cup (or glass) of tea while gazing at the herb garden. 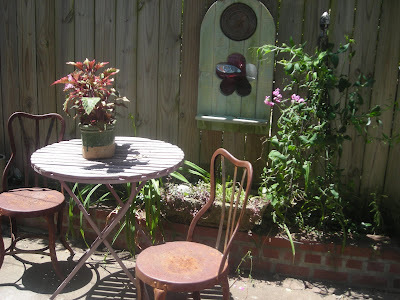 But July is not known for mild temperatures -- it may be September before I can truly enjoy the "new" table in the garden. The blue pot was a gift from a dear friend when Jim's mother passed away -- it had a lovely hydrangea in it. This friends knows my affinity for blue and it is a perfect pot for this spot of the garden! I think of her every time I gaze out the breakfast room windows and see the pot of cheery marigolds. 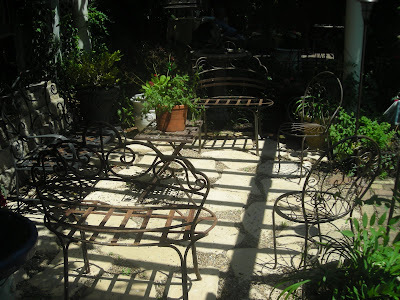 Interestingly, Husband Jim and I lugged the table from patio to pergola. It is heavy with the iron top and iron legs but we managed and got it in place. While he was preparing to paint (in the pergola -- we weren't about to lug the table from pergola to driveway to paint) somehow the table fell -- and off came the top -- it's two pieces and if I knew that I certainly forgot it! It made lugging the one piece -- the iron top -- so much easier. Off to the drive it went (and now we have rust colored gravel). It's Monday which means that it's time for Met Monday -- please join Susan at Between Naps on the Porch to see what other metamorphosis there are this Monday. It's always fun to see what projects we've been working on! 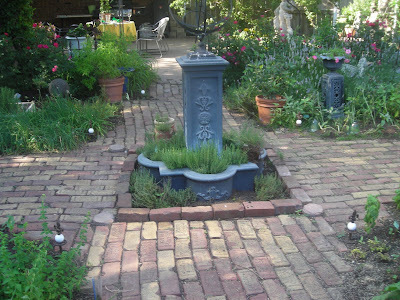 And it is also Blue Monday -- and what better blue than a pot in the garden? Join Smiling Sally to see what other blues there are this Monday? Blue blue summer skies, perhaps? Back in May, I asked for you help -- to vote for our Fort as one of the 8 Wonders of Kansas History. Voting closed at midnight on June 15 and the winners were announced last Tuesday. We love our Fort -- it was what founded our little town and we are proud that in the 70's it became a National Historic Site and was reconstructed and restored. It is a great place to visit on Summer Sundays -- walking around the Fort, feeling that you're part of history, realizing all that happened on those grounds over the last 168 years. We're an old town for Kansas -- most of Kansas being settled after the civil war. And as you leave the Fort, you see our historic downtown which recently was named to the National Register of Historic Places. Fort Scot is a great place to roam on Summer Sundays! It's blue skies over our Fort. And I'm asking for your help. We've made the short list of 24 for the 8 Wonders of Kansas History and I'd love to see our beloved Fort named one of those 8 Wonders. You don't have to live on the prairie to vote -- it's open to everyone so I would appreciate your help to make sure that our Fort is one of the 8 Wonders of Kansas History. Please read about the candidates -- it does give an idea of what an interesting historical story Kansas weaves. And you can't just vote for our Fort -- you have to vote for 7 others as well. Because the sky is blue over the Fort, it's Blue Monday so please visit Smiling Sally to see other blues this Monday! It's Sunday and so time for Sunday Favorites so please join Chari at Happy to Design and also enjoy Summer Sundays at The Tablescaper. We have a love affair with stargazers -- the late June and early July bloom in the garden -- we love their pink color and their heady fragrance. We're always excited when the first one pops open and we usually bring it inside to enjoy both his beauty and it's fragrance. Our first one for 2010 was this week. We're elated over this first bloom . . . . and there are many more in the garden still in bud. We find that we're always able to "tuck" a few more here and there in the garden -- besides enjoying them outside we also enjoy them inside in bouquets for the table. They're a magical lily and much appreciated in Linderhof's garden. And in winter, if we can find them, we'll splurge with a boughten bouquet now and again -- they make summer seem that much closer when it's dreary outside. It's Pink Saturday so please join Beverly at How Sweet the Sound to see what other pinks there are this Saturday! Kansas isn't South but we do have enough South in us that "local favorites" include fried chicken and biscuits and gravy (creamy sausage gravy) and iced tea. But we're not that Southern for you don't often find a Grits dish on menus in Kansas (unless you eat at a Cracker Barrel). But we like Grits. Not often but it does make a good side dish with grilled or roasted beef. This was a new recipe. With herbs from the garden and Boursin cheese -- it was a yummy dish. I made half the recipe which was perfect for filling two small ramekins for dinner. I gilded he lily by garnishing with some chive stems. The recipe comes from a favorite herb cookbook -- Cooking with Herbs by Emelie Tolley and Chris Mead. It's in the Southern section, of course! In a large saucepan, bring water and salt to a boil. Slowly add the grits and cook for 10 minutes, stirring frequently. Add the butter and cheese. When they are melted, add the parsley and chives. Blend thoroughly and serve. It's Food Day so it must be Friday -- join Michael at Designs by Gollum to see other other fantastic food offerings there are on this Foodie Friday! Last Wednesday, the Lutheran Church in the little town 20 miles east of us had their annual Salad Luncheon. Friend Sally and I attended and had a great time, tasting all of the good salads -- always two meat, two vegetable and two fruit, with Sally's (but not friend Sally) breadsticks and a dessert -- this time it was a chocolate peanut butter cookie. We did a bit of shopping after and then when we got back to Linderhof, there was tea and a cake awaiting us for a midafternoon nosh. The table still held Tuesday's Quaker Lace tablecloth and the blue vase with the lacecaps. And, of course, I had to use my blue and white. Spode Blue Room cups and saucers, tea plates and even a teapot. Mrs. Boland's silver forks and a wee starched pressed napkin. There is nothing so homey as a lace tablecloth, a vase of flowers, a cake and the Spode! And the cake -- a new recipe that I wanted to try. From an old cookbook bought at a garage sale during the last month. The 50 cent price was worth every penny if I got nothing else but this cake. It's French and translates to "Everyday Jam Cake". I fudged and added lemon zest to the batter and lemon curd instead of jam. Sally pronounced it "the best"! With lemon in the cake and in between the layers, yellow sugared pansies seemed the ideal decoration. It's Thursday and time for tablescapes. 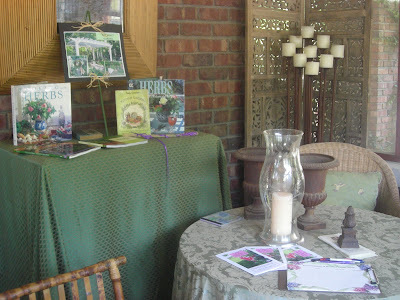 So please join Susan at Between Naps on the Porch to see what everyone is doing on their tables this Thursday. At Linderhof, we had afternoon tea! The tea of choice with this lemon cake? An Earl Grey with a hint of citrusy bergamont. Cream the butter, sugar and vanilla together in a large mixer. Add eggs and beat until blended. Sift and measure flour. Combine with baking powder and salt. Add to creamed mixture with milk. Beat only until blended. Lightly oil a 9 inch layer cake pan with 2 inch sides. Dust with flour. Cut waxed paper to fit bottom of pan and place over flour. Spoon in cake batter and bake at 350 for 30 minutes. Cool in pan on rack. As soon as cake is cool enough to handle, invert it onto yur hand and quickly peel off the waxed paper. Place cake sooth-side-up on serving dish. Split in half horizontally. Spread jam between layers. Place a lace paper doily on top of cake. Sift powdered sugar over top. Carefully remove doily. Serve the cake warm or at room temperature. NOTE: I added the zest of 1 lemon to the batter. And then I used lemon curd instead of jam between the layers. 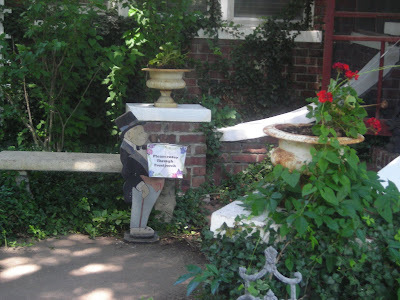 Saturday, a group of members of the Bourbon County Master Gardeners and Garden Club traveled south to Pittsburg to attend the garden tour sponsored by the Zone 6 Garden Club. They hold their tour in even years -- on Father's Day Saturday and we hold our tour in odd years on Father's Day weekend. Last year, we were in a gardening frenzy as the gardens of Linderhof were on tour -- this year, we were able to relax, travel to Pittsburg and enjoy being a garden guest rather than a gardener! It was a great tour and the members of the Zone 6 Garden Club do a great job. All of the gardens were great and, of course, I had camera in tow. Pictures from the tour . . . 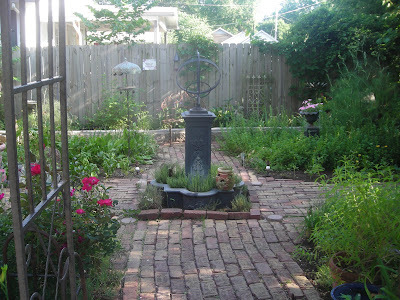 It's Wednesday which means that we're all over at Susan's A Southern Daydreamer -- see what else is Outdoors this Wednesday! 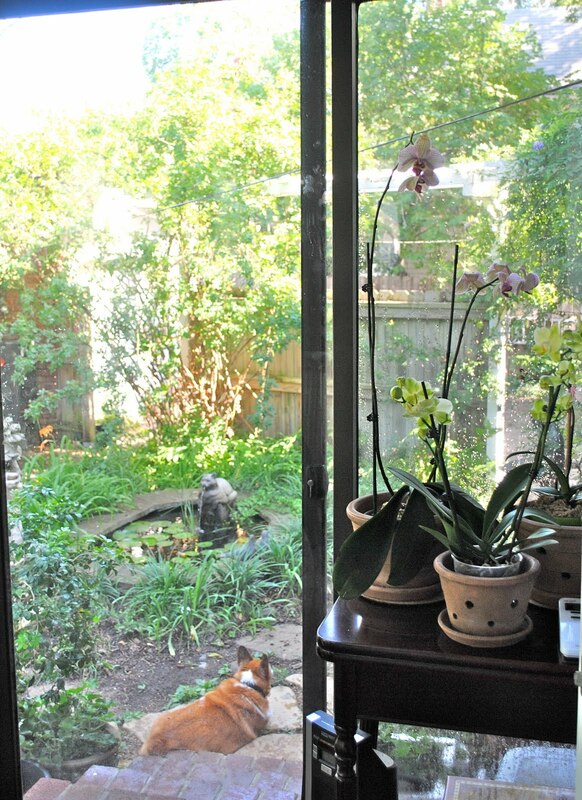 I first knew orchids when I was a teen and read Nero Wolfe -- his brownstone with the top floor being a greenhouse devoted to orchids. He'd spend mornings and afternoons up there tending to the orchids with his gardener. Rare and prized were orchids and one could only grow them with the proper greenhouse -- or so I thought. But then there were orchids at Costco. 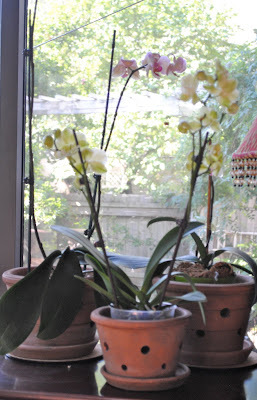 The common and easiest grown orchid -- phalaenopsis. And so, one came home with me and then another and another . . . They are easy to grow and I've even got them to rebloom. And they have such interesting colors. And they are perfect on this tabletop in the breakfast room -- a cluster of them -- so much better than a lone orchid here and there! The one on the left is white with hot pink stripes and is still blooming from March! The little lime green one in front is new -- replacing one that didn't make it. And the one on the right is one that soon will be blooming -- but I've forgotten what color it will be. 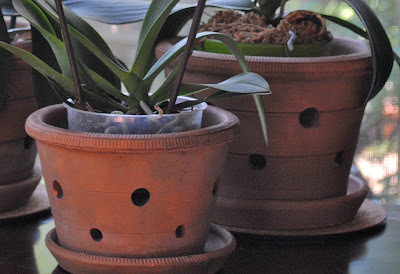 I don't like "fancy" pots for flowers -- preferring terra cotta ones -- someone plants look better in terra cotta -- and these -- these are Guy Wolff orchid pots. A perfect vessel, methinks, for orchids. It's Tuesday and I'm joining Marty at A Stroll Thru Life for Tabletop Tuesday. And what's on the dinner table this Tuesday -- the first, the very first garden tomato -- special enough to be a course on it's own. Sliced with a shower of garden basil and a sprinkle of sea salt. It's Blue Monday and what better for Blue Monday than a Blueberry cake on a Blue platter! This is a wonderful cake -- great for a picnic dessert OR a breakfast sweet as well as an afternoon tea nosh. It goes together easily even though you have to whip the egg whites. And it is especially good with fresh blueberries which are now coming to the market in mass. Blueberry time of the year is one of my favorites -- following on the heels of strawberry time. You can make it with frozen blueberries but I think it is so much better with the fresh! I like the sprinkle of sugar over the top -- it adds a glitter and shine! Preheat the oven to 350. Beat the egg whites until soft peaks form. Gradually beat in 1/4 cup sugar and continue beating until stiff and glossy. Set aside. In a large bowl, cream the butter. Add the salt and vanilla. Gradually beat in 3/4 cup sugar. Add egg yolks and beat until light and fluffy. Remove 2 T. flour to a small bowl. Sift together the remaining flour and the baking powder. Alternately mix the dry ingredients and milk into the butter mixture, beginning and ending with the dry ingredients and beating until blended before each addition. Stir in 1/4 of the egg whites to lighten the batter. Gently fold in remaining egg whites. Toss the blueberries with the reserved 2 T. flour. Fold into the batter. Turn into a greased 8 inch square metal baking pan. Sprinkle the remaining 1 T. sugar over the top. Bake 50 to 55 minutes or until a tester inserted in the center comes out clean. Let cool before serving. It's Blue Monday so join Smiling Sally and see what other blues there are this Monday. As the swallows return to Capistrano in the Spring, so do the flamingos return to our little town on the prairie in the summer. It's not a large flock but it does stay within the city limits as it moves from house to house. Usually staying a week before they move on. Some of them have been around for a while and actually we have three different broods -- but they are all pink and they are all flamingos! And they all like to flock! The reason that the flamingos return to our town every summer . . . .it's a funraiser sponsored by the Chamber of Commerce Tourism Division. It makes a little money but the smile that flock of flamingos bring to our visitors is why we do it. Other towns may have their cows on their horses -- we have the flamingos! It's Pink Saturday -- and what is pinker than a flamingo? -- so please join Beverly at How Sweet the Sound and have a great Pink Saturday!